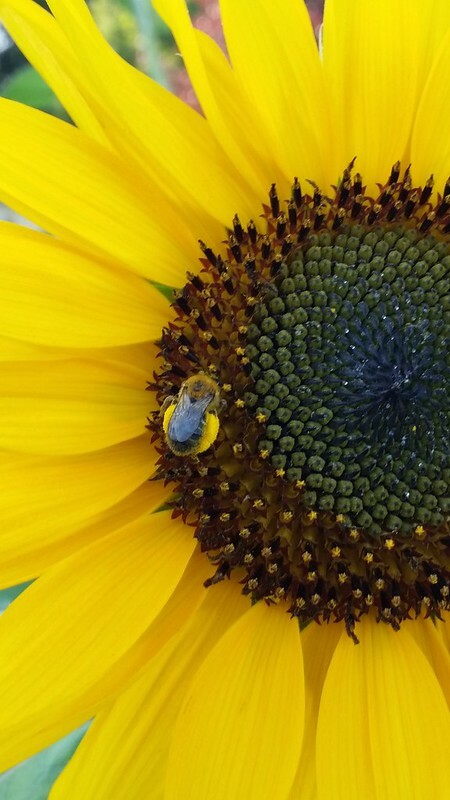 A big sunflower with a bee collecting pollen on it--enough that its legs are yellow. I know--I keep doing the bee on flowers thing. Well, it's summer and it's not like I get to do this for much longer. BEEsides, it's hard to say no to such photos when walking along BEEcause you're never quite sure what other fabulous moments you might come across in a given day. I like this photo because i don't have the full sunflower--it works to only show part. It think the bits of pollen on different parts in the flower's center sticks out fairly clearly, especially since the bee is gathering up a far amount of pollen on his wings. I have to wonder if I would have noticed the pollen on the legs if it was just flying around--rather than being in the center of the flower and invoking the yellow petals.